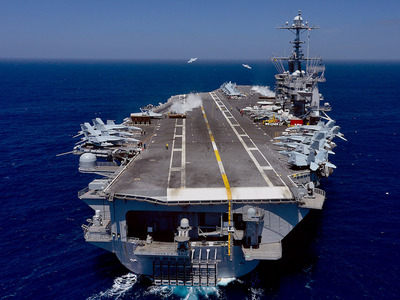 Despite aircraft carriers’ immense cost, the Navy believes there is no replacing a well-armed, aircraft equipped, sovereign piece of US territory, powered by dual nuclear reactors. Former Defence Secretary William Cohen was fond of saying that without “flattops” the US has “less of a voice, less of an influence.” Evidently, many of the worlds nations also believe this is true. The last few years have seen a number of interesting developments for aircraft carriers. Some nations, like India and Spain retired aircraft carriers, while China commissioned its first aircraft carrier, and the UK returned to the rather exclusive carrier owners club. The US commissioned its newest aircraft carrier in 2017 – the USS Gerald R. Ford – the first in the Ford-class. Business Insider got a chance to tour the Ford last year. In all, 20 aircraft carriers can carry and launch fixed-wing aircraft are currently in service around the world. Walter Hickey and Robert Johnson contributed to an earlier version of this story. History:Queen Elizabeth is the lead ship of her class and one of the newest aircraft carriers in the world. It is currently Britain’s only active aircraft carrier, with the second Queen Elizabeth-class aircraft carrier, HMS Prince of Wales, still under construction. The ship was laid down in July 2009, completed in July 2014, and commissioned in December 2017. Business Insider was able to take a tour of the ship in December, shortly after its commissioning. Queen Elizabeth is unique from other carriers in that she has two control towers, one for sea operations, and one for air operations. The carrier is intended to have up to 40 aircraft, with the F-35 intended to be the main fixed-wing jet for the ship. Other aircraft planned to be included are Chinook helicopters, Apache AH MK1 gunships, AW101 Merlin transport helicopters, and AW159 Wildcat anti-surface warfare helicopters. More recently, Queen Elizabeth docked for the first time at an overseas port when it visited Gibraltar on February 2018. The carrier should be fully operational by 2020. History: USS Gerald R. Ford was laid down in November 2009, completed in October 2013, and commissioned in July 2017. It is the lead ship of its class, and is planned to be the first of 10 new aircraft carriers. The ship is still in a testing phase, but is intended to have a planned complement of more than 75 aircraft, mostly F-35Cs. As it is the Navy’s newest carrier, new weapons may be added to the ship in the coming years, including lasers. 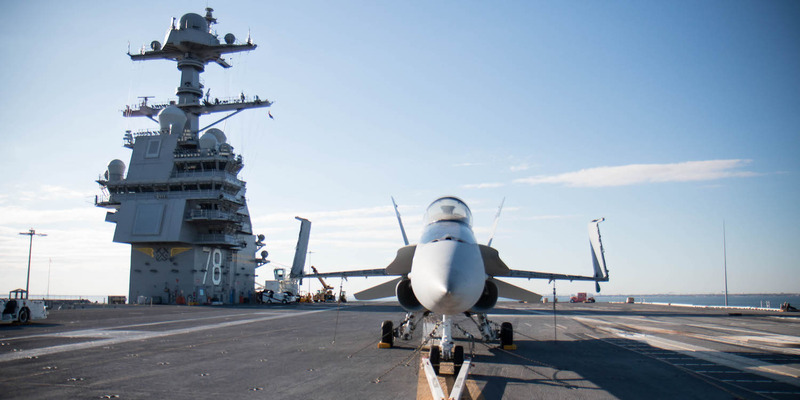 The ship has a number of new technologies, like the Electromagnetic Aircraft Launch System, which is intended to replace the current steam-powered launch system on current aircraft carriers. 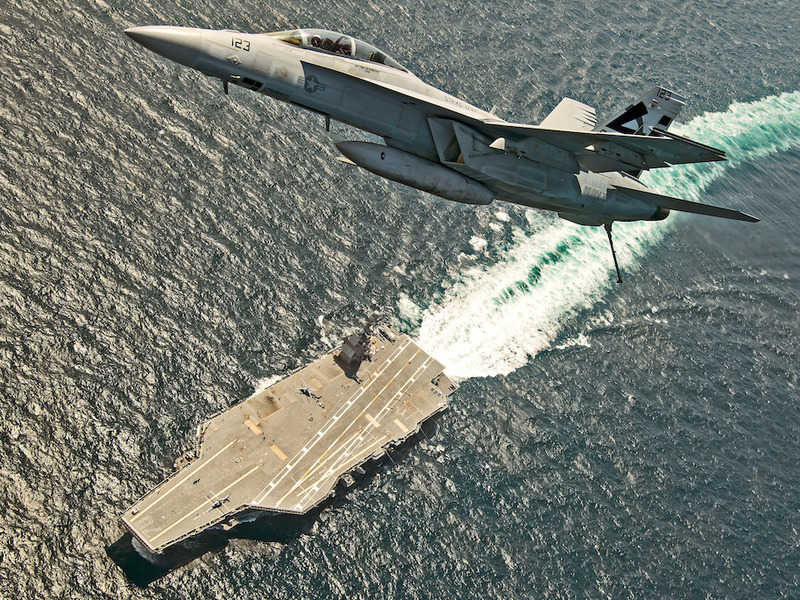 Gerald R. Ford recently tested launching F/A-18F Super Hornets off of its deck last July. It is expected to be fully operational and integrated and into the Navy by 2022. History: INS Vikramaditya is currently India’s only aircraft carrier, after India retired the INS Viraat in early 2017. Vikramaditya is a modified Kiev-class aircraft carrier. It was originally built for the Soviet Navy in 1982, and served the Soviet Union under two names; Baku from 1987 to 1991, andAdmiral Gorshkov from 1991 to 1996. India purchased the carrier in 2004 after years of negotiations for $US2.35 billion. After extensive modernisation and modification efforts, the Vikramaditya entered full service in the Indian Navy in 2013. It carries a total of 36 aircraft; 26 MiG-29K and 10 Kamov Ka-31 and Kamov Ka-28 helicopters. The Vikramaditya recently became the first ship in the Indian Navy to have an ATM on board. History:Liaoning is the Peoples Liberation Army Navy’s first aircraft carrier. It was laid down in 1985 and was originally meant for the Soviet Navy. After the collapse of the Soviet Union in the 1990’s, the carrier, which was little more than a rusting hull with non-functioning equipment, was purchased from Ukraine by a Macau-based company in 1998. China had previously purchased two former Soviet aircraft carriers to be used as tourist attractions, and the Liaoning,known as the Varyag at the time, was deemed to be too deteriorated to be able to be used for active duty, and the Chinese Navy was more focused on submarines at the time. It took over a year for the aircraft carrier to be towed to China, where it immediately began to be modernised and fitted for military duty. Liaoning was completed in 2011 and commissioned in 2012. It participated in a drill in the Miyako Straite in 2016. The carrier has an air wing of 26 Shenyang J-15 multirole fighters, 12 Changhe Z-18 anti-submarine warfare/transport helicopters, and 2 Harbin Z-9 utility helicopters. It’s the most recent Nimitz-class carrier addition to the Navy, delivered in May 2009. 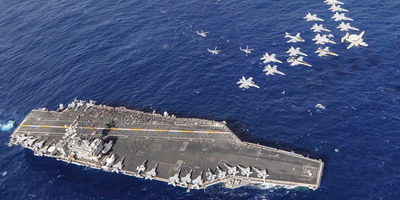 It is the last of the Nimitz class of carriers. George HW Bush served in Operation Enduring Freedom in Iraq. 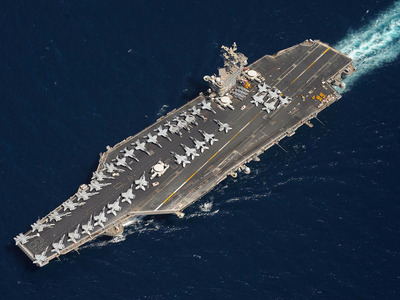 In 2014, the carrier was one of the first to launch air strikes against ISIS. Crew: 451 crew, 203 airmen, 140 command staff, and 325 Marines. 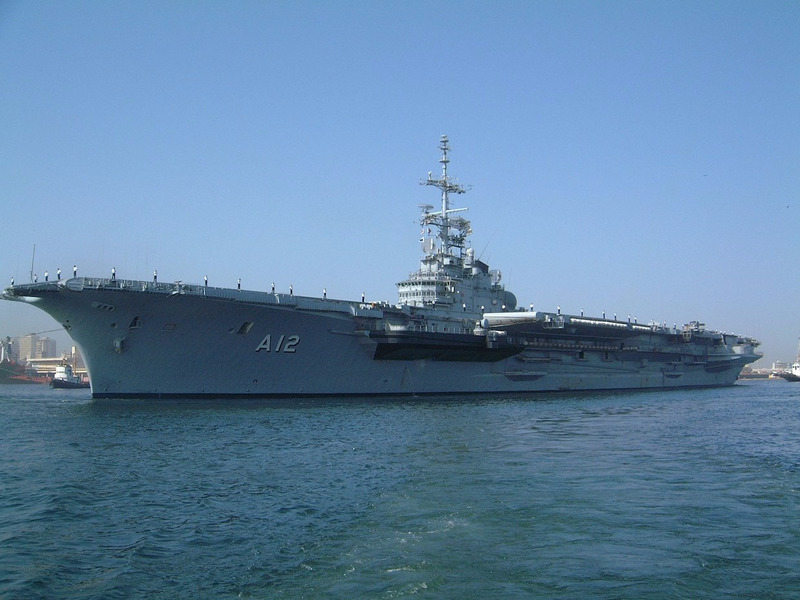 History: Launched in 2004, the Cavour is the flagship of the Italian Navy. The Cavour’s first mission was an aid mission to Haiti after the 2010 earthquake. The Cavour will be eventually be stocked with the F-35B Joint Strike Fighter, replacing the ageing Harriers. It has room for ten F-35Bs in the hanger and six on the deck. The F-35B version of the jet has a short takeoff and vertical landing capabilities. History: The USS Ronald Reagan is stationed at Yokosuka Naval Base, in Yosuka Japan. It saw a 2006 deployment which brought it to the Persian Gulf. It’s served in both Operation Iraqi Freedom and Operation Enduring Freedom. 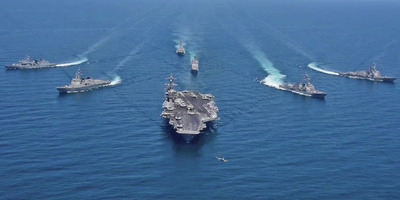 Reagan has been involved in a number of drills in Asia since its deployment to Japan. It has practiced operations with Australia, India, Japan, and South Korea. It has also been involved in a number of air policing actions. In October 2015, jets from Reagan intercepted two Russian Tupolev Tu-142 bombers east of the Korean Peninsula. Last November, aircraft from Reagan again intercepted Russian bombers flying near it. While originally plagued with production issues – there was a recession at the beginning of construction, allegations of British spying in the middle, and technical issues toward the end – the carrier was deployed to the Indian Ocean during Operation Enduring Freedom and the initial liberation of Afghanistan. The de Gaulle carried out air strikes against believed al Qaeda targets and conducted combat air-patrols with the US Navy off the coast of Pakistan. More recently, de Gaulle was involved in France’s contribution to the air campaign against ISIS in Iraq and Syria, codenamed Opération Chammal in France. In 2016 its aircraft participated in the Battle of Mosul. Since February of last year, de Gaulle has been under an upgrade and refit in France, a process that is expected to take 18 months to complete. 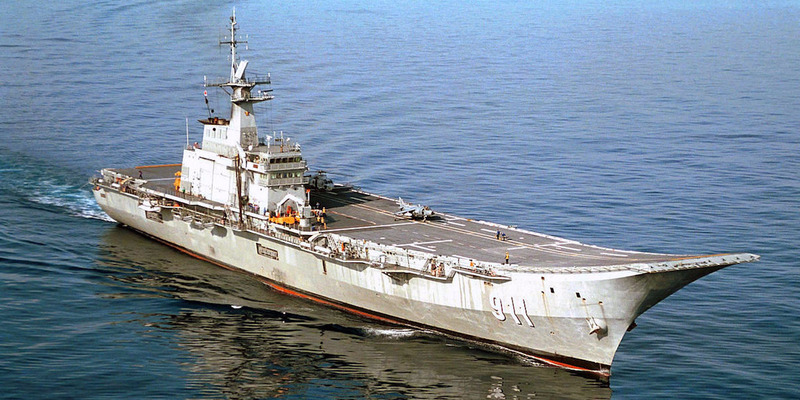 History: For an absolute bargain price of $US12 million, for a naval flagship, theSão Paulo was bought by Brazil to upgrade their ailing fleet. São Paulo is currently demobilized. It suffered a number of fires and accidents that have made the ship not worth maintaining, and is now awaiting decommissioning. History: The Truman, called the “HST” or the “Lone Warrior,” is stationed at the Naval Station Norfolk in Virginia. The HST was launched in late 1996, first serving abroad during the enforcement of the no-fly zone and eventual hostilities over Bosnia. The HST then served during Operation Southern Watch and flew 1,300 sorties during Operation Iraqi Freedom. Truman was involved in the air campaign against ISIS in 2015. By the end of its deployment, its air wing had dropped over 1,118 bombs on ISIS target, passing a previous record set by USS Theodore Roosevelt’s air wing earlier that year. History: The Chakri Naruebetis Thailand’s only aircraft carrier and the flagship of the Royal Thai Navy. Chakri Naruebet was built in Spain 1994 and launched in 1996. The ship has spent most of its life in dock, but has been deployed on several disaster relief missions in the aftermath of the 2004 Indian Ocean earthquake and floods in 2010 and 2011. 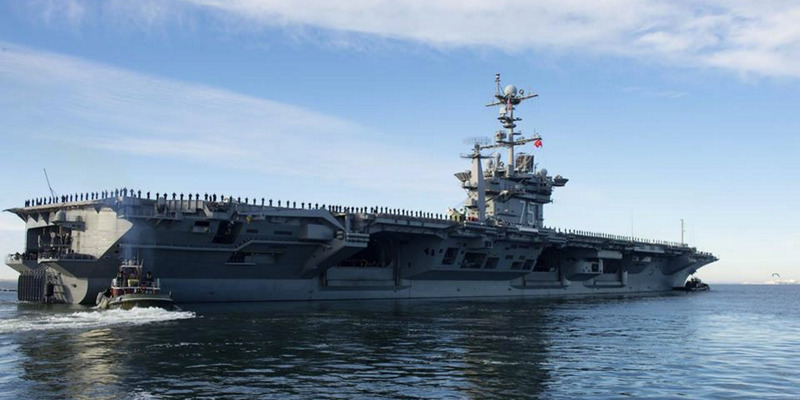 History: The Stennis has home port at Naval Base Kitsap in Washington. It’s nicknamed “Johnny Reb,” and is named after the former Senator John Stennis from Mississippi and was commissioned in 1995. History: The USS George Washington, nicknamed “GW” or “G-Dub”, is currently stationed at Yokosuka, Japan. It was in the Persian Gulf in 2000, and was in New York Harbour after 9/11 providing airspace defence. It has served in Operation Southern Watch and Operation Enduring Freedom. In order to explain to the Japanese what the aircraft carrier was doing in their harbour, the Navy had a 200 page manga made to explain the ship. 30,000 copies were distributed. George Washington helped in disaster relief in the Philippines, following the aftermath of Typhoon Haiyan in 2013. The aircraft carrier also helpedHaiti recover from Hurricane Matthew in 2016. Propulsion System: Steam turbines. Eight boilers, two turbines, nine turbogenerators, six diesel generators, four propellers. History: While the full name – Admiral of the Fleet of the Soviet Union Kuznetsov – is a bit of a mouthful,this ship is one of the largest carriers and the flagship of the Russian Navy. Originally launched in 1985, the Kuznetsov wasn’t fully operational until 1995 after the fall of the Soviet Union. Her sister ship, the Varyag, was never commissioned and sold to China as a hulk by Ukraine. Kuztnetsov became the first Russian aircraft carrier to ever see combat when it was sent to Syria’s Mediterranean coast in 2016 to assist in Russian combat operations. Its aircraft flew 420 missions and hit 1,252 targets. Kuznetsov did, however, show its age by losing two aircraft due to technical malfunctions of the carriers arresting gear. The first incident was in November 2016 when a MiG-29K ran out of fuel while waiting for repairs to the arresting wire, and the second was just a month later, when an Su-33 crashed because the arresting wire failed to hold the aircraft. Following these mishaps, Kuznetsov’s air wing was forced to operate from air bases in Syria until the issues were resolved. It was first deployed when rendering relief to US personnel on Luzon island in the Philippines during the eruption of Mt. Pinatubo, moving 45,000 people off the island. It carried out air patrols over Mogadishu in Somalia and was the first carrier to fully integrate female airmen. It served in Operation Iraqi Freedom. 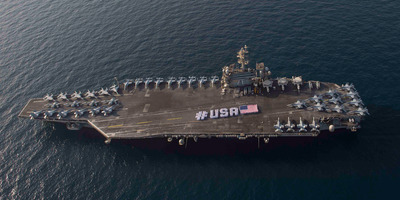 President George W. Bush gave a speech in front of a “Mission Accomplished” banner on the ship upon its return. It helped during Japanese Tsunami relief and recently passed through the Strait of Hormuz. After a four year refuelling and complex overhaul,Abraham Lincoln finally returned to active duty in 2017. It was recently deployed to Florida to help with relief efforts from Hurricane Irma. History: The USS Theodore Roosevelt is stationed at Naval Station Norfolk in Virginia. Nicknamed “TR” or “Big Stick,” its aircraft flew 4,200 sorties in Desert Storm and dropped 4.8 million pounds of ordnance. The carrier enforced no-fly zones over Bosnia, Iraq, and carried out airstrikes in Kosovo. In Operations Enduring Freedom and Iraqi Freedom, the TR’s aircraft flew 3,100 sorties and dropped 59,500 pounds of ordnance. Roosevelt was used in 2013 as the test platform for the X-47B, Boeing’s attempt to make a UAV for carrier-based operations. The carrier was also sent to the Arabian Sea to prevent weapons shipments from getting into Yemen in 2015. Roosevelt was a big part of the fight against ISIS. Its air wing conducted over 1,800 combat sorties that dropped over 1,085 guided munitions on Islamic State targets. History: Italy’s first aircraft carrier, the Garibaldi was commissioned in 1985. She has a long service history, including combat air operations off Kosovo, Afghanistan, and Libya. Harrier fighters from the Garibaldi carried out 30 sorties over the Balkans in 1999. Planes from the Garibaldi carried out 288 missions in the first year of the War in Afghanistan. During the NATO Libya mission, planes from the Garibaldidropped160 guided bombs during 1221 flight hours. History: The USS Carl Vinson is named after the congressman from Georgia who served in the House during the Second World War, and later oversaw the transition of the Departments of War and the Navy into a singular Department of Defence. The carrier has a number of nicknames – “Starship Vinson,” the “Battlestar,” “The Gold Eagle,” and “America’s Favourite Carrier” to name a few. It was the carrier that buried bin Laden at sea. It also was the carrier that hosted the UNC vs. Michigan State University NCAA basketball game in 2011. 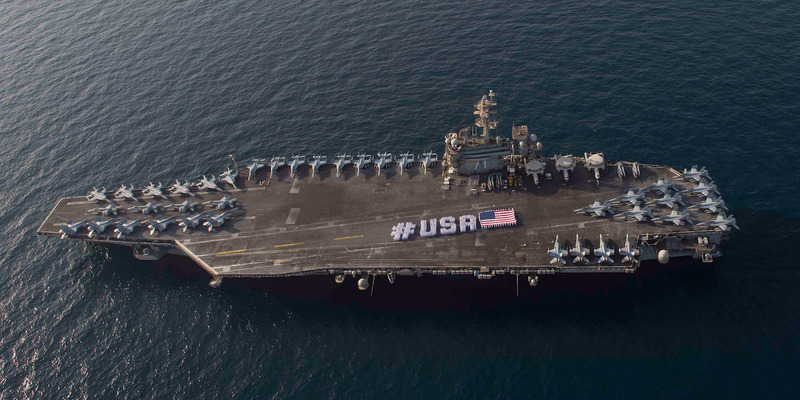 In 2014, Carl Vinson was deployed to the Persian Gulf to assist in the fight against ISIS. 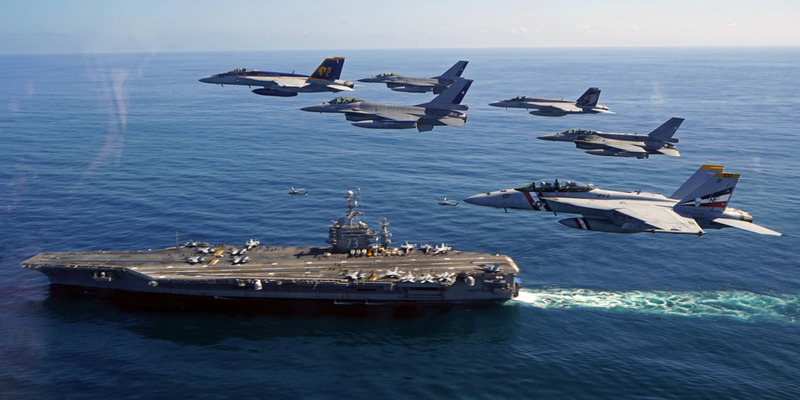 Over the course of its deployment, aircraft from the Carl Vinson flew 12,300 sorties, 2,382 of which were combat missions, and dropped more than half a million pounds (230 tons) of ordnance on ISIS positions. History: “Mighty Ike,” or the USSDwight D. Eisenhower, served during operation Eagle Claw during the Hostage Crisis. It went through the Suez Canal to the Red Sea during Desert Storm. Eisenhower also contributed her aircraft to the fight against ISIS. Aircraft fom the Might Ike dropped nearly 1,100 bombs on a number of ISIS targets in Iraq and Syria. The Eisenhower‘s home port is Naval Station Norfolk in Virginia. History: The Nimitz, nicknamed “Old Salt,” is the first in its class of supercarriers and has a long history of Naval service. 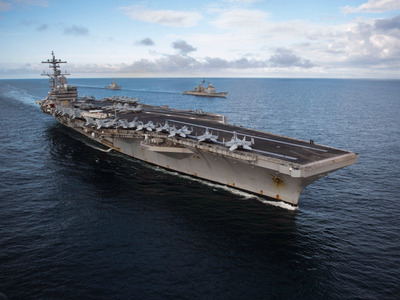 Named after Chester Nimitz, the man who led the Navy throughout the Second World War, the Nimitz first was deployed to the Indian Ocean during the Iran Hostage Crisis. In June of 2017, USS Nimitz was deployed to the Middle East and assisted in the Battle of Tal Afar. 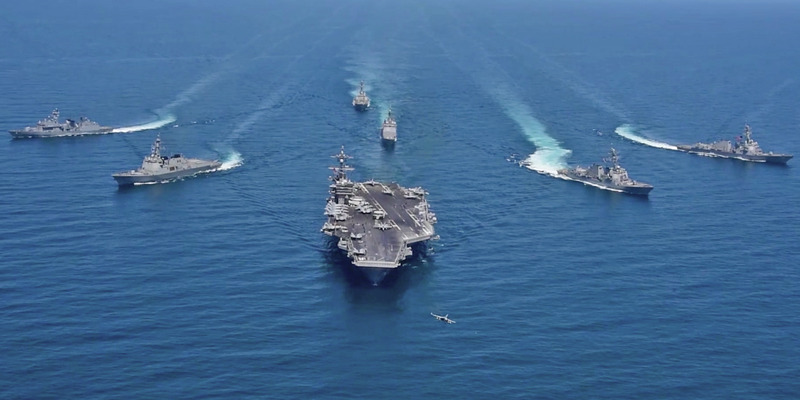 It was also part of an exercise in the Korean Peninsula with two other US aircraft carriers, and a number of South Korean Navy vessels. The Nimitz‘ home port is Naval Station Everett in Everett, Washington.